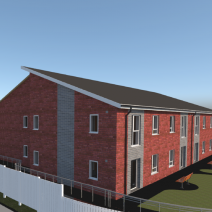 This site has been leased from MCC to provide much needed care provision containing 20 self contained one bed apartments with multifunctional communal/sensory rooms and landscaped gardens Assistive technology provisions will also be available. Once built MCC will provide the care provision and staff the development 24 hours a day. This is the only scheme of its type being built in South Manchester, with 3 similar schemes being built in North Manchester.